Baja is finally done and this event is the same weekend as the Sandstorm 300 race. Maybe next time guys. well... to be honest... right now my list is ugly on both the rail and the Baja. My post run inspection of the rail found more damage I need to address before it goes out again... just a few things I knew were getting close to needing repair but were ok for now.. well my armor needs attention and a crack in my radiator is starting to leak when the car is cold and I need to replace a seal that is leaking oil on my power steering not bad but it bothers me. that's why I switch from the RV and the rail to focus on the Baja.. the Baja is a lot more work than I thought but it will be the faster fix of both the rail or RV. 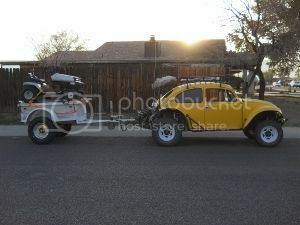 I need to get some more wheel time on the Baja before I take it deep,,, I need to work the bugs out. the date is wrong... its May 20th and 21st. No clue, cheap empi kit that claims 25 degrees. I'm not sure of the exact date's but normally it's a Sat morning to Sun mid afternoon FRIGGING Awsome run! Since I live on the polar oposite of the starting point I usually camp up at the fourth spring, that way I can sleep in a little break camp and start to listen to chatter on the radio. that way I have an idea how soon there going to pass by me, then I simply jump in line and away we go! can someone please check the date..... 20-21 is a Friday-Saturday....correct? or did daylight savings really mess me up( since we in az don't change) cause that would explain things. let me know cause work will need a written day off excuse from somebody who cares.